El balón de helio de AHMET ÖĞÜT voló hace pocos días. Fue en Ghent, en el curso del festival -o la art experience como ellos le llaman- TRACK. "Öğüt takes the socialist history of Ghent as the starting point for his contribution to TRACK, which is entitled ‘The Castle of Vooruit’. 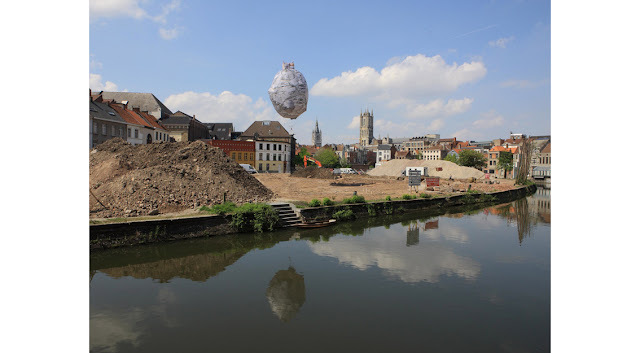 He concentrates on the Vooruit, the cooperative where the working-class people of Ghent assembled from the end of the nineteenth century until the early 1970s and which ran both a centre for festive occasions and a newspaper. 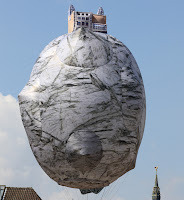 Making reference to ‘Le Chateau des Pyrénées’ (1961) by the Belgian surrealist painter René Magritte, Öğüt is sending up a gigantic helium balloon in the shape of Magritte’s floating rock, launched near the Vooruit Arts Centre. 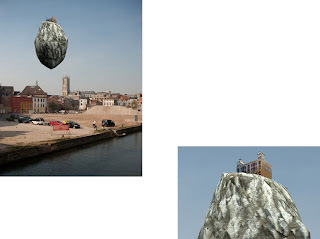 He is replacing the mysterious castle on top with a replica of the Vooruit building. 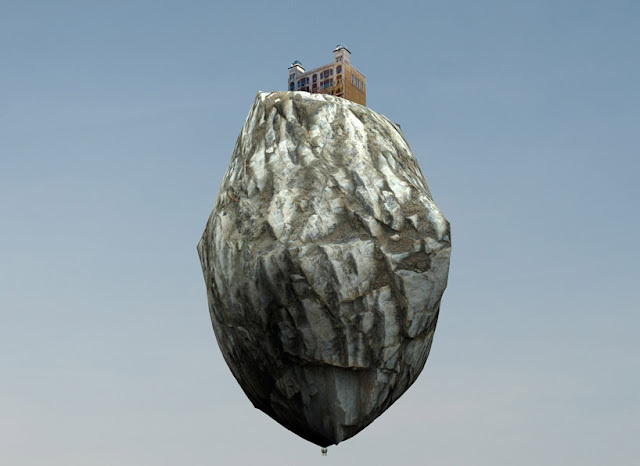 Öğüt captures the failure of a set of utopian social ideas in a single surreal image". Por lo que intuyo, yo detectivesca, hay la fotografía que me gusta mucho que es maqueta o photoshop y la real que también gusta pero no tanterrimamente... es? 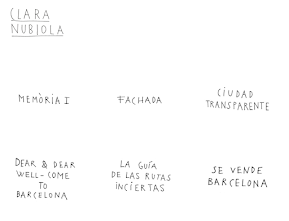 Encantada con sus proyectos atención a por ejemplo Waiting for a bus o The Swinging doors..